President Donald Trump’s imminent decision on whether to hit China with tariffs starting Friday could easily make this the best or worst week of the year for the stock market. The implications of the Trump China tariff decision are that big: Either we’re at the outset of a technological cold war with Beijing, or — more likely — Trump’s trade threats will prove to be mostly bark, not bite. The big Wall Street fear is that the Trump China tariff decision won’t just trigger retaliatory tariffs on U.S. goods, but will provoke Beijing to find additional ways to hinder U.S. multinationals like Boeing (BA), Caterpillar (CAT) and Apple (AAPL) in Chinese markets. Beijing has already held the merger of Qualcomm (QCOM) with NXP Semiconductors (NXPI) hostage. The Dow Jones industrial average — which includes Apple, Boeing and Caterpillar — opened solidly lower on the stock market today, but rallied to close slightly higher. The Dow Jones remained just below its 200-day moving average after undercutting that key support last week. The S&P 500 index rose Monday after undercutting its 50-day line once again intraday. The Nasdaq composite led with a 0.8% gain. But if the Trump China tariff threat is put to rest — or at least put on hold — the relief could be palpable. In a Sunday note, Morgan Stanley warned that President Trump is likely to follow through on his tariff threats. “An escalatory cycle of protectionist actions, not just rhetoric, has begun and will continue,” wrote Michael Zezas, chief strategist for U.S. public policy at Morgan Stanley. Growing alarm over Trump trade policy should give way to a major relief rally if the president calls a cease-fire with China this week. 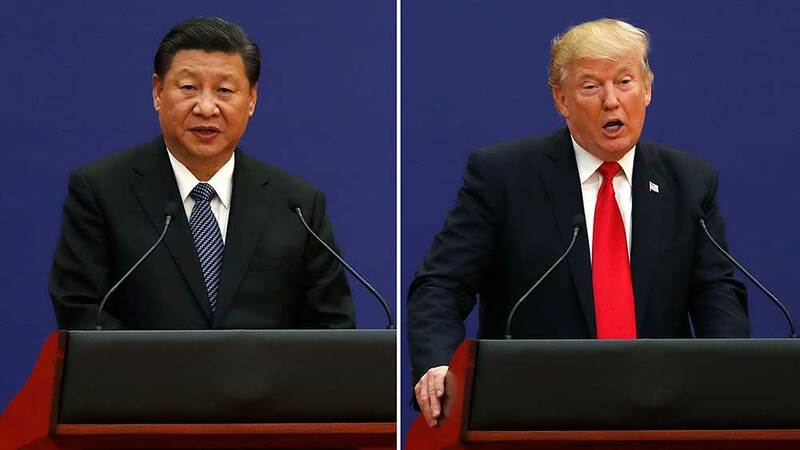 Trump is set to hit Beijing with 25% tariffs on $34 billion worth of mostly tech-related imports on Friday, July 6. The same day, China is ready to hit back — dollar for dollar — with tariffs aimed primarily at autos and agriculture. Chinese imports from Ford and Tesla would be hit with an extra 25% tariff, more than reversing Beijing’s cut in auto import tariffs from 25% to 15%, effective July 1. Daimler has already warned that it expects Chinese tariffs on its Alabama-built Mercedes-Benz SUV to hit sales and profits. Here’s why the deadline is so important: Trump has already bent over backward to appease Beijing. If the two sides can’t make enough progress toward a trade cease-fire this week to avert the imposition of tariffs, then a deal will become even less likely as threats turn to outright hostilities, which may quickly escalate. The U.S. has tariffs on another $16 billion worth of goods from China, including semiconductors, nearly ready to go, and China is ready to retaliate. Beyond that, Trump has directed trade officials to draw up tariffs on another $200 billion worth of Chinese imports. But there’s good reason to expect a deal, or at least a delay in the Trump China tariff deadline. If Trump really intended to launch a China trade war, he probably wouldn’t have gone to bat to save 70,000 Chinese tech jobs. First, he pledged to reverse sanctions that had forced Chinese communications gear firm ZTE out of business, pushing back against a Senate move to reject a lesser punishment. Then, last week, Trump dropped a plan for emergency China investment and export rules, including a 25% limit on Chinese ownership in firms buying key technology. Trump instead took a less combative tack, backing legislation in Congress to strengthen the Committee on Foreign Investment in the United States, or CFIUS. Reading between the lines — and threats — Trump has already made pretty clear that he wants a trade deal, not a China trade war, and he came close to reaching one in May that would have had Beijing buy an additional $70 billion in U.S. goods. Even though it would have done relatively little to narrow the trade deficit with China, Trump touted the emerging deal, tweeting that China would “buy massive amounts of ADDITIONAL Farm/Agricultural products” from the U.S.
China appears open to such a deal, if it can avert tariffs and trade restrictions that jeopardize its “Made in China 2025” strategy. Signs of an economic slowdown in China and financial fragility only raise the importance of a trade cease-fire. If Trump reaches an accord with China, Wall Street may begin to relax about Trump’s threat to hit U.S. auto imports with tax of 20% to 25%. The European Union has reportedly threatened to retaliate with tariffs on $300 billion worth of imports from the U.S., the equivalent of a full-scale trade war. But General Motors (GM), Toyota (TM) and other automakers have warned that Trump’s plan could sink U.S. auto sales by 2 million vehicles a year and deliver a hit to manufacturing employment. Like Trump’s threat to launch a full-scale trade war against Beijing, a big tax on auto imports looks so potentially disruptive to world trade that it may begin to be seen as lacking credibility.